Facebook has integrated system to send and receive messages from other Facebook friends. We have already seen easy way to filter Facebook messages among: unread, archived, email only and spam. By default, if you click X cross sign next to messages, it is not deleted – instead that messages is archived. Are you trying to figure out way to delete messages in your Facebook account? At first, it appears – there is no way to delete messages. However, you can delete specific messages one by one using following procedure. 1. After Facebook login, click on Messages option on left sidebar. Now you should see list of messages that you have received over period of time. Click on specific message that you want to delete. 2. This will open complete message conversation. Now click on Actions button and then click Delete Messages option. You should see pop-up to delete all or delete selected messages. Similarly, you can open other messages and delete them as per requirement. Over a period of time lot of messages accumulate, you can always delete them for cleaner messages section of your Facebook account. By default, you need to open single message and then delete it. Facebook does not provide ‘Delete all’ button to wipe delete all messages in your account in single click. 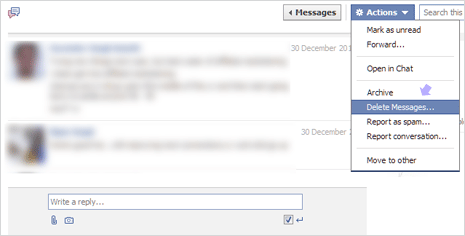 You can add this feature to your Facebook account by using Facebook Fast Delete Messages Chrome extension. 1. Open Google Chrome browser and download Facebook Fast Delete Messages extension. Once this extension is installated, open and login into your Facebook account. 2. Goto to messages section and you should see new “Delete All’ button next to “New Message” button. Click Delete All button to delete and remove all messages in your Facebook account in single click.